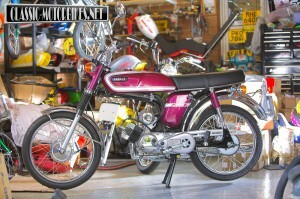 A true icon of the 70’s the fizzie became the must have for any 16 year old of the period, and now the root of many a mid life crisis and middle age desires too. 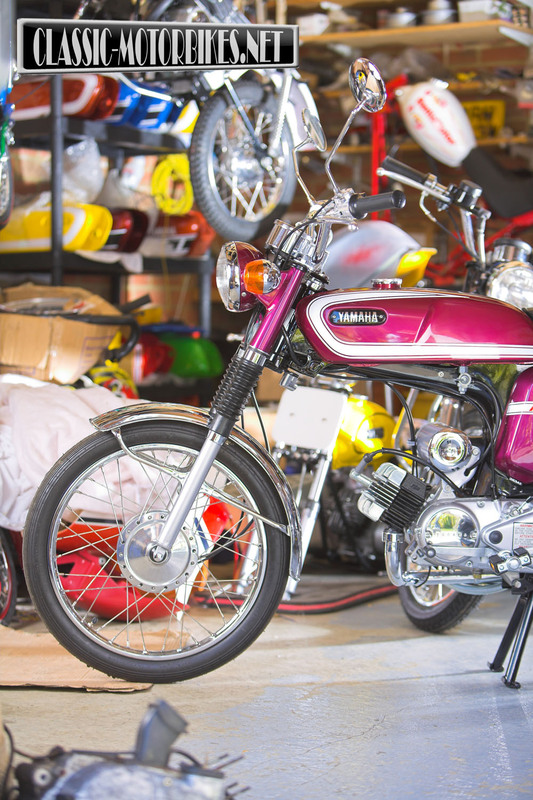 48-year-old Tony Collins is a talented paint sprayer, who describes himself as being stuck in a seventies time warp “I love old sports mopeds” he laughs. 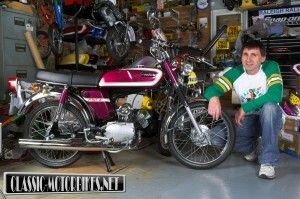 “I have been restoring and painting cars since I was 17, this all started when a mate of mine wanted stars and stripes on his crash helmet, I do own a Suzuki GT750 as well as the fizzys, but my true love is my Fantic choppers i have four of these to date. Tony decided to restore a fizzy when a mate went to the Brighton mini show in May 2005. “He called me to say there where some fizzys there, he emailed me the pictures and, reminiscing as you do, I went out on a mission to buy one. 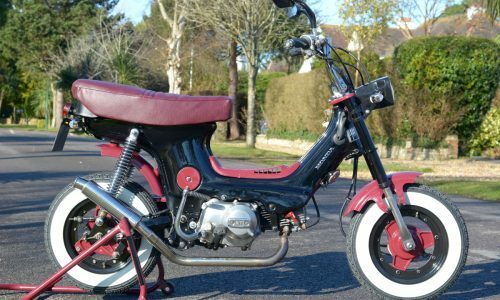 I already had the Fantic chopper which I had at 16 but wrote off and then bought a fizzy to finish my moped days off, so to restore a fizzy was the next on wish the list. It had to popsicle purple as this was the colour I had at that ripe age. TKJ 74N was my original bike and I would have ideally loved to have it back but these things never happen to me, but just in case she is still out there please do get in touch. I found a 1974 FS1E on eBay and luckily, the sellers phone number was on the listing, so I called him only to discover he was based in Devon, some way from Herne Bay where I live, just how was I going to get her home was a real problem. 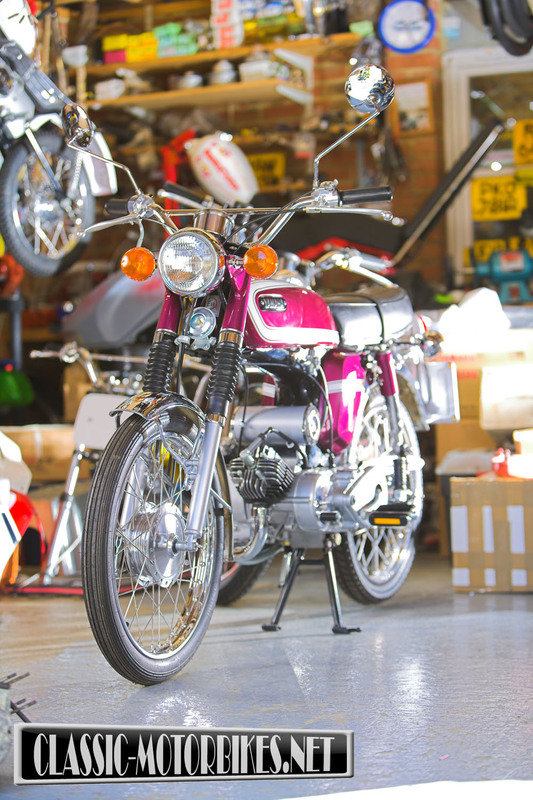 He stated he was coming to Whitstable (the next village on from me) to collect an RD 400, so we had a deal and the bike was mine next day, it landed looking very sorry for its self so I delved in feet first and stripped her to every last nut and bolt. I then went on ebay and set about buying everything I could find that was a genuine part. 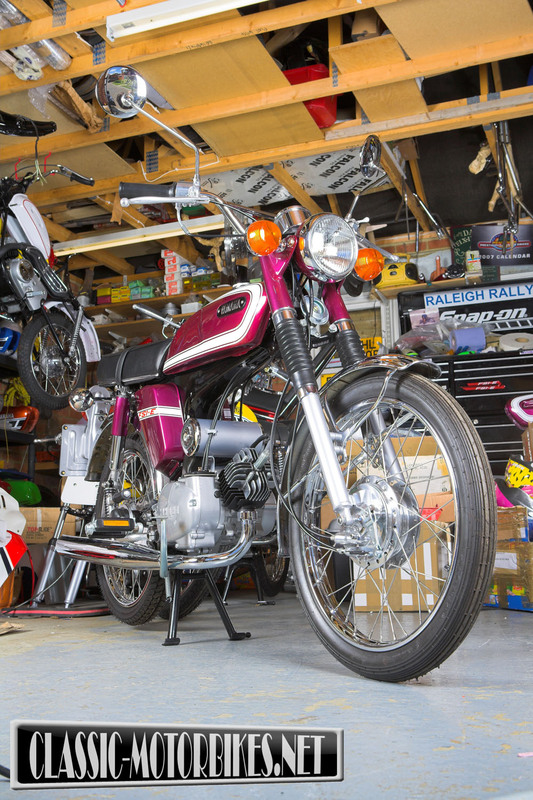 This turned out to be a sizeable mistake as prices can often end up inflated as people get into a bidding frenzy, its best to check with your local Yam dealer on the price and availability of parts first as often things are still in stock and not as pricey as you think, although this scenario is begetting more rare by the day. 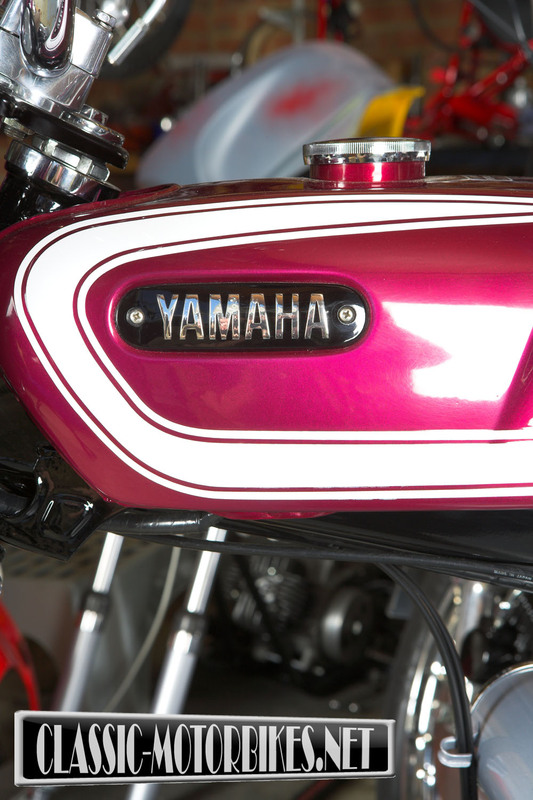 Being a painter, my business is called Custom paint and I specialise in bike paintwork, I set about painting the bodywork first. The candy colour proved a little difficult at first but having painted over 150 fizzy tank sets since then I have now got it sussed, then painfully over the next 2 and half years, collecting parts from all over the world, she came together. 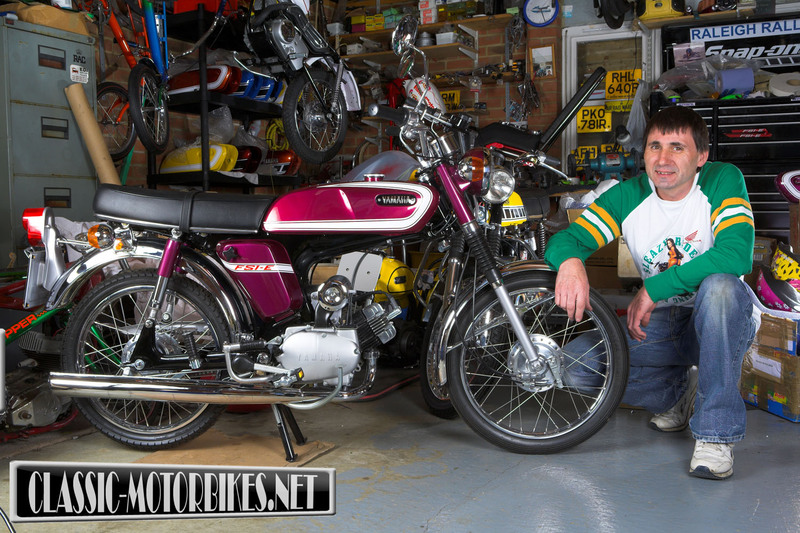 My mate Ray stripped and rebuilt the engine for me, another old school mate and ex speedway rider, Paul Wood rebuilt the wheels, the London chroming company did the chroming and Central engineering in Hythe did the polishing and slowly a little stunner was born. I sent the frame off to be powder coated but when it came back it looked so naff I wet painted over it. I bought a pair of genuine mudguards off eBay only to find the holes where all in the wrong places, so I had the get the holes filled and then get the muddys rechromed, I think they cost me about £600 in total. I always intending to ride it but as the restoration has cost me in excess of £5k, I decided not to. I managed to get a NOS exhaust, and I then had that rechromed so I just couldn’t bear the thought of discolouring it, the bike does run and everything works just as it should although to be honest, I did run it up with a pattern exhaust to make sure all was well before refitting the genuine item. 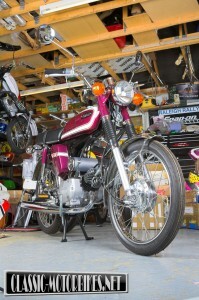 There are no pattern parts on the bike at all, even down to the three little ignition keys that would have come with the bike when new. I don’t think that I could ever rebuild another fizzy to this standard as the parts are now almost impossible to find, One thing I wish I had of learnt earlier into the project and it was my own fault for not giving it a thought and that was to go to the Yamaha dealers as they still make a lot of the parts and I did buy all the genuine nuts and bolts from them. I set up a sports moped forum to get tips and advice and have met some wonderful people as the bike came to completion just 2 days before the Sports moped mania event at the Billing Aquadrome, the bike was finished and I took it along to the show where I was asked to show the bike at Stafford in the October and the bike would take pride position on the main stand. 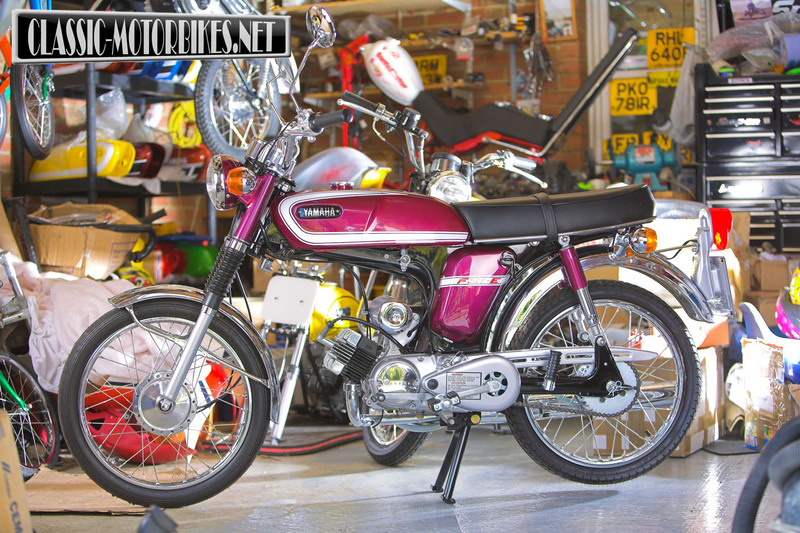 It was a great challenge to restore a little fizzy and its just one of those cult 70’s icons that a keen collector must have in his collection and most modern day bikers started life on. I have now got a FS1E DX that although I have built from just a frame and engine, is nearly completed, again all genuine Yam bits have been used but I intend to ride this one. I have given it a bit of custom paint here and there but have kept it along the original lines. I am always willing to pass on advice to anyone who wants to embark on restoring a fizzy. I would like to thank The Image works for continuously suppling me with fizzy decals, and Nick at my local Yamaha dealers, The Bike Shop of Faversham plus all of the guys on the Sixteener special forum. Make sure you wife loves you enough to let you spend endless hours in the garage playing.